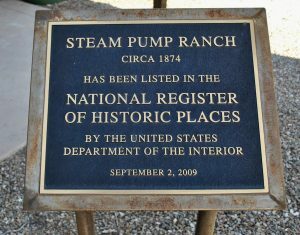 February 9…It’s Second Saturday at Steam Pump Ranch! Join your neighbors and mosey over to Steam Pump Ranch for Second Saturday activities on Saturday, February 9 from 9am to 1pm. There’s the Heirloom Farmers Market with lots of produce coming into season, demonstrations by Archaeology SW and crafts for kids in the Heritage Garden and tours of the Pusch Ranch House (PRH). Be sure to stop by the PRH and see the history display regarding the Tully-Ochoa Wagon attack. Did you know it happened right here in our neck of the desert? Docents will also take you on a tour of the PRH and provide local history. Interested in joining OVHS or learning more about us? Then visit our tent and let us fill you in. Our Volunteers Are Worth Their Weight in Oro!